IBM Punched Card stock is paper :-)) 0.007 +- 0.0004 inches thick with rather tight specifications. "Card size is exactly 7 3/8 by 3 1/4 inches (187.325 mm × 82.55 mm). The cards are made of smooth stock, 0.007 inches (180 µm) thick. There are about 143 cards to the inch (56/cm). In 1964, IBM changed from square to round corners." 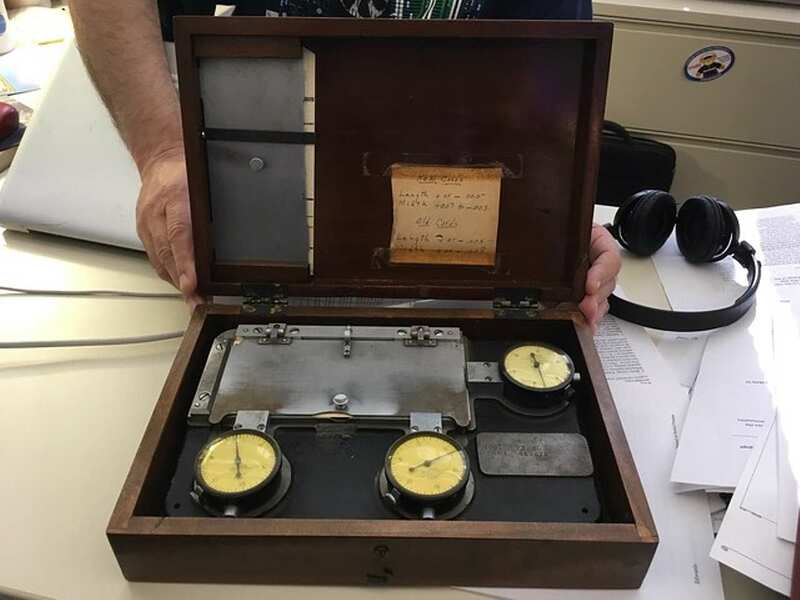 from Dag Spicer, "Hey, an older gentleman from Sacramento just dropped by the Museum this morning unannounced and offered us this object. It was used by the State of California to measure the dimensions, including thickness, of the sometime non-IBM punched cards they used for government purposes." Ah, the punch card wars. "Everyone" wanted to make a bundle selling punch cards under the price and quality leader, IBM. - verify competing cards were "up to specification"
- convince IBM to let customers to service/adjust IBM machines to better run the cheaper cards. We leased our process control scanners, gauges, and software to paper companies to help them control their paper making machinery. - when full an empty roll magically begins to accumulate the streaming paper. Papermaking is still very much an industrial art. *but* get paid by the ton of on spec paper! Serious, thoughtful, alert, cooperative work! This is not a paper makng lesson - a fascinating field in its own right. The following are the specifications that IBM insisted paper makers meet. The tale of how the following documents got to my scanner and CHM is interesting. A month later Roland Sundstrom of Orinda called saying that he was a friend of Dan Aston and he had gotten specifications from old CvG friends in Holland (of the Netherlands) .